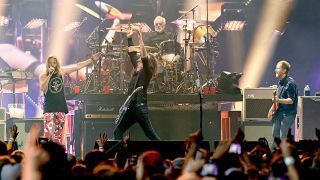 On Saturday evening, Foo Fighters took to the stage in Atlanta to play a special pre-Super Bowl show. The concert was live streamed on Twitter – and it saw the band joined by a host of guest stars to play through a selection of classic tracks. Not only did Zac Brown and Tom Morello join them for a cover of Black Sabbath's War Pigs, but the pair stuck around for a while – and were soon joined by Jane’s Addiction frontman Perry Farrell to play Mountain Song. But perhaps the highlight was when Queen drummer Roger Taylor joined the Foos for Under Pressure, with Taylor Hawkins giving up his drum stool to share vocal duties with Dave Grohl. Introducing Taylor, Hawkins told the crowd: “Well, my mentor is here tonight. Mr Roger Taylor – and he’s going to do a Queen song with us. How about that? Video of all three performances has been uploaded and can be watched below. To promote the DIRECTTV Super Saturday Night show, Foo Fighters starred in a spoof video last month, showing the band as players for the hapless San Fernando Jackalopes. The video also starred Curt Menefee, Terry Bradshaw and Michael Strahan.